The result of making 1000+ presentations over the period is not only helped us win the trust of the clients but the love of the jury of various award organizers. 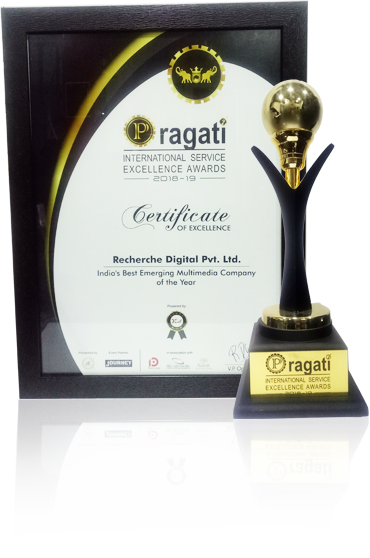 We are happy to share that Recherche Digital has been recognized as the best multimedia company and begged Pragti international service excellence award followed by best technology company award from Brand Impact. With this, we started the year 2019 with a bang. 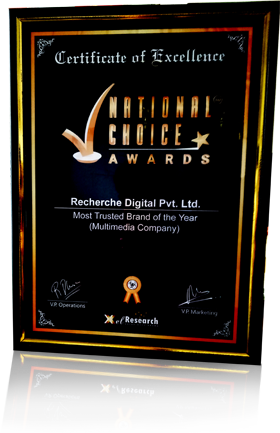 Two awards in a row boosted the confidence of the entire team of Recherche Digital and we wanted to share all with you. It is you who are the center of our all activities, the inspiration of innovation and it's you whom we want to see success with our little contribution to technology in your organization. When the aim of any company is to uplift the client's business, the growth comes handy. Recherche Digital formed by serial entrepreneur Mr Harish K Saini, who also formed Bharat Infotech, known for making quality presentations and Show To Clients, one and only platform in the world to host & promote all kind of business #videos & #presentation. 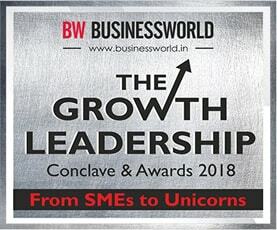 In his recent interview done by the celebrated host Aman Verma in a popular TV show #SafarKamyabiKa , he was asked many questions where Mr Saini, explained the significance of a happy man-power and customer-elation in these changing times and how they stand aligned with the very vision of his company, Recherché Digital. The core of Recherché Digital's working is to work hard consistently with its clients to take their business to next level through company's presentation making services, Digitalization and Automation services. During the discussion, Mr. Saini shared the future-plans of the expansion of his company to Europe & Middle-East & North African regions. While mentioning the recent project-experience done for ISRO (Indian Space Research Organization), Mr. Saini described how through strategic tie-ups, his company is ready to provide world-class presentations to Fortune 500-companies. He spoke about the philosophy of three wins at three levels, i.e. Win, Win & Win, wherein he put in plain words that working only for the benefit of its own business wouldn't take any company far, but a combined progress surely can be achieved in a sustained manner when our efforts collectively benefit all the shareholders. Members (in Recherché Digital, each employee is considered as a member of the company and so, the word Employee is not used), the company and clients & vendors, the Win in its true sense must be grasped by all the participants in a project or business. In the tete-a-tete, Mr. Saini stressed that each one of us must push our boundaries to get the best from ourselves & while doing so, everyone in the business-chain gets benefitted in terms of better product, better pay-out and better learning. He also talked about how using +1 policy in the company has done wonders for him. The policy merely means value-addition in the sense that he and his members in the company always make this extra effort to go one step ahead of client-expectations. He also divulged the details about his upcoming book in which he, through his experiences in the presentation-industry, tries to enlighten entrepreneurs with the insights in accepting the defined challenges of going to the next level. He also humbly denied investments from investors saying that his company has thus far remained self-funded and currently holds sufficient funds to fly into future. He was very assertive in telling the audience that even though he had formed three companies, Bharat Infotech, Show To Clients and Recherché Digital, his entrepreneurial quest and restlessness shall continue. 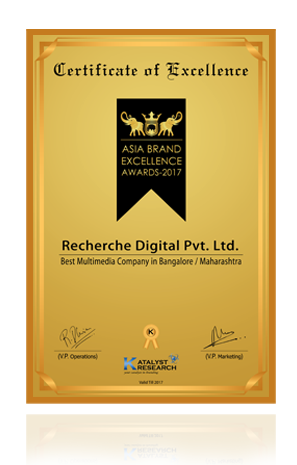 This has been one of the most happening and exhilarating years for Recherche Digital and so all eyes were on us. After Project Antrix, Abbott, Mahindra, PHD & other high value projects, our market reputation elevated significantly. Despite the ruthless competition we managed to come to the top. 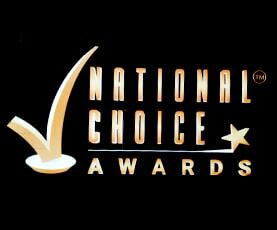 Katalyst Research, the leading market research and brand consultancy company, rewards companies best in their domain, and they selected Recherche Digital to be the recipient of the 'National Choice Award'. Every company strives to be better than the rest and the previous self, so does Recherche Digital. The award ceremony held on October 7, 2017 at Radisson, Gurgaon witnessed the presence of innumerable aspirants and achievers. 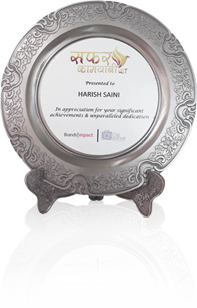 Walking with poise and dignity, Harish K Saini, the director of Recherche Digital, represented us in award ceremony. Our director received the award from the Bollywood Actress, Neha Dhupia. . The award was indeed another milestone in our journey to the best. 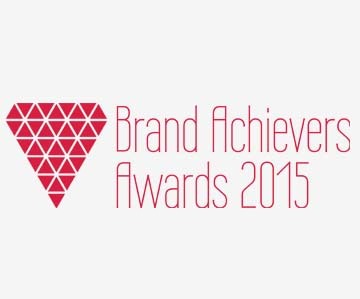 Not the first, but this has been one of the biggest award in our list of our awards. We have been rewarded with the ' Best multimedia company' twice in a row in 2015 and 2016. 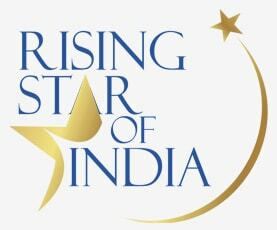 'Rising Star of India' in 2016 was a real feather in our cap received in International forum at Bangkok, Thailand. The 2016 Silicon review referred to Recherche Digital as ‘One-stop solution for all multimedia presentation needs’. Also, we were in the list of 30 Fastest growing companies of 2016. With every award we have become more responsible and client-oriented. 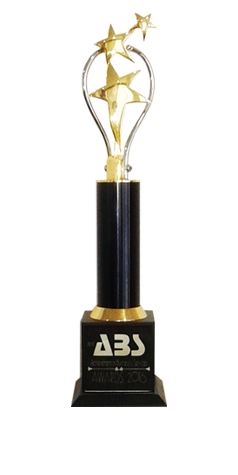 With every award the stake increases and so does our standard. People often ask us what is so different about Recherche Digital. Every team has well trained professionals, efficient techniques, updated technology and understanding leaders. So what makes Recherche Digital stand out of the crowd. It is simple. We never give up and that is one thing that all winners have in common. We work tirelessly to make our preparations flawless. Most importantly, we never doubt ourselves. We never doubt our capabilities and so have no boundaries. We believe doubts kill more dreams than failure ever will. 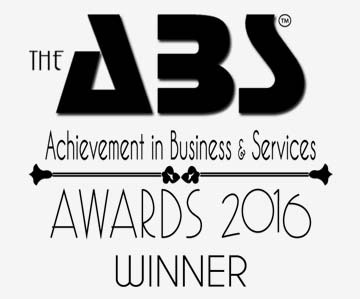 We are now the most award winning company in our domain and there is no turning back. We are determined to excel and bring prosperity to the nation. For us excellence is an increasing-function and nothing changes that. We no longer wait for opportunities, we create it. There is no limitations to what we can be, have or do! As markets evolve, so do we. 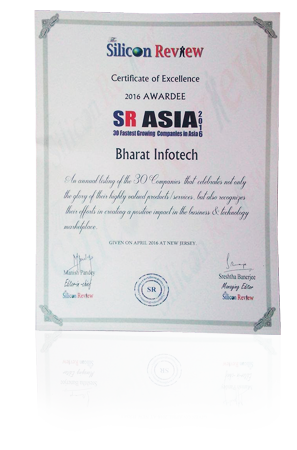 We are glad that you recognize our contribution to your success by choosing Recherche Digital ( Bharat Infotech) as winner in Digital Business Services. Your successive support over the years, reinforces our resolve to be the trusted service provider for Smart Digital Business, as we work with you to modernize, automate and transform your business using industry-leading technologies. 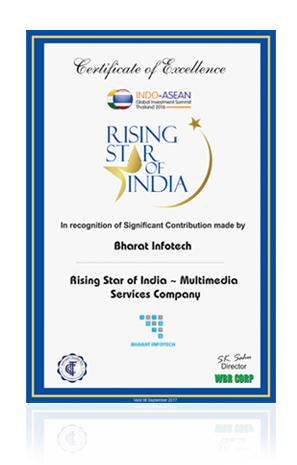 Your favourite Presentation Company, Bharat Infotech has been awarded as Rising Star of India, in an international event for its significant contribution in Multimedia Presentation Services at Indo-Asian Global summit held in Bangkok on 17th Sep, 2016. The enormity and level of the stage spoke for itself as it was shared by numerous international companies of the world, with some prominent names from India as well, like Bank of Baroda, Asian Paints & Bajaj Electricals. The Event was held in the magnificent riverside Ramada Hotel with many international dignitaries, local chamber of commerce, officials of Indian embassy in Thailand and scores of luminaries from different fields being in attendance. We would like to share our joy with all of you and would like to reiterate that our profound belief in the commitment to customer-satisfaction & high-quality service has been reinforced. We know for the fact that it is because of your abiding trust and esteem in us that we stand high, fly high and this time, we have flown beyond national boundaries with global wings. 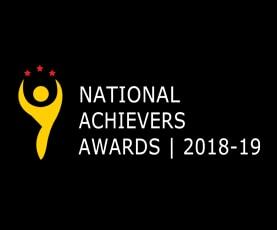 But we assure you that this is just another award for us and however high and far we fly, sticking to the basics and honest client-engagement will remain the fulcrum of our functions. Another Landmark Achieved!! 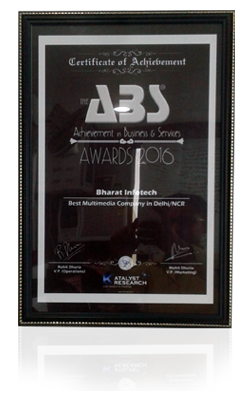 Yet another landmark achieved, after winning Brand Achiever award in 2015, we won ABS award for Best Multimedia Company in the starting of 2016 in a gracious function held in Hotel Radisson. Award was presented by Ms Amisha Patel & received by senior members of our team. With more than 1000 presentations, 6000 minutes of output and 100,000 views we are pioneer in presentation making and same is recognized by industry. With this award we would like to thank you all and assure you that we will continue delivering our best services to you and many new clients. 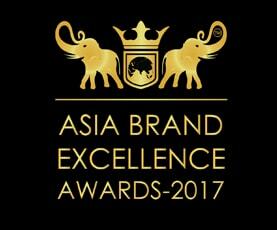 Look forward to have your support & love in our journey of excellence!! Your favorite service provider is now favorite of masses . 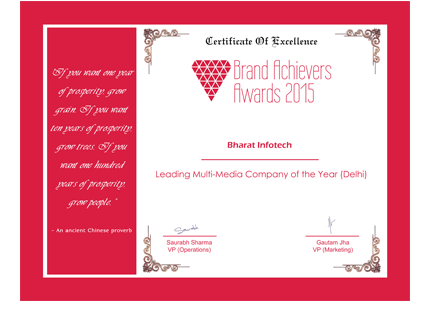 We recently awarded by Brand Achievers for Leading Multimedia Presentation company. With more than 1000 presentations delivered and appreciated by clients like you, we were only company with this much of big portfolio and client list. With this award we would like to thank you all and assure you that we will continue delivering our best services to you and many new clients. 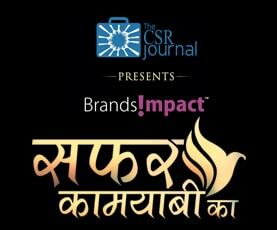 Look forward to have your support & love in our journey of excellence!! 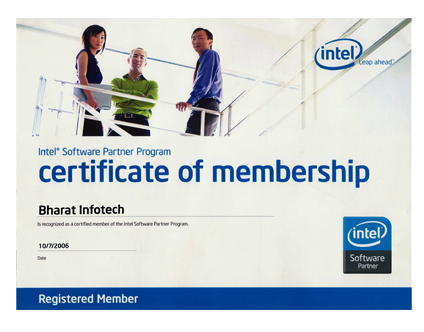 Bharat Infotech is the official software channel partner of Intel in India. We make the presentation and software which are much faster efficient and safe and give wonderful performance when used on Intel powered machines. 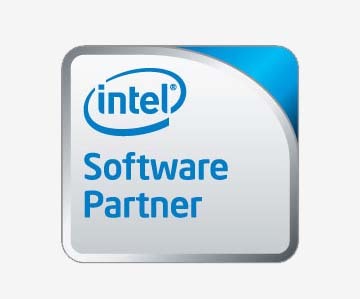 Our partnership with Intel helps us in updating our development and keeps us abreast in technological advancement. We also provide feedbacks, performance to Intel so that those can be analyzed and improved upon. 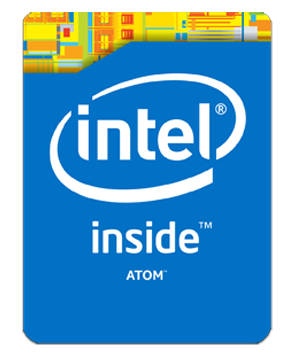 Atom developer program is perceived by Intel for their upcoming Apps store which will soon be available on all notebook powered by Intel Atom Processor. Bharat Infotech is leading App designing company for Intel. We are providing various useful Apps for the Intel App Store. These apps are from various useful sectors like education, information and games. Some of the apps designed so far are given below in their beta format. These apps are defined and tested by strict norms of Intel. We are in process of designing at least 25 apps in first.